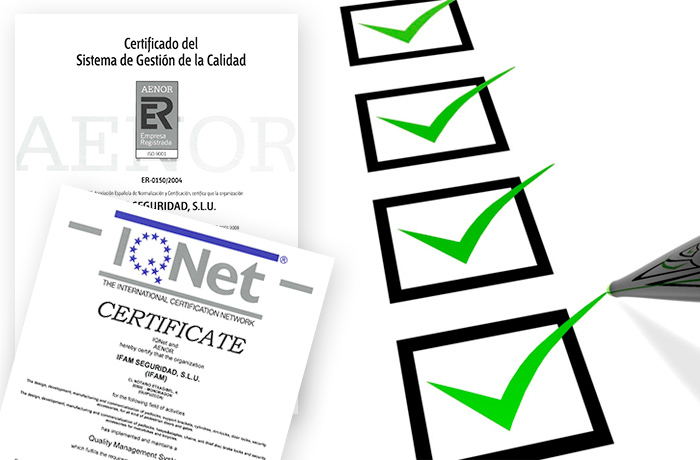 IFAM SEGURIDAD has quality certifications in accordance with ISO 9001:2005, issued by AENOR and IQNET. These documents certify the quality of IFAM’s management and processes, materialized in the production of locksmith and anti-theft devices. In addition, IFAM complies with the requirements set forth in the standard, corresponding to customer service, delivery of products and completion of its services. This standard also includes the mechanisms of internal measurement and analysis aimed at the continuous improvement of the products and services that IFAM offers.